During Monday night’s showdown between the New York Giants and the Detroit Lions, I looked up from my seat and saw Jamal Agnew maneuver though a sea of Giants ready to take his head off en route to a stunning 88-yard punt return touchdown at Metlife Stadium. Seconds after he deflated a stadium full of fans, I looked down at a Microsoft Surface tablet and saw who kicked the ball, how fast it traveled, and even how fast Agnew was running. The RFID chips in the footballs will track data such as velocity, rotation, ball speed, and location. Are you ready for some football … tracking? The NFL has placed coin-sized radio-frequency identification (RFID) chips from Zebra Technologies inside footballs for every game this season to provide a deeper dive into statistics, information the league has never effectively captured. The advanced stats the NFL will collect from players and footballs could be used in fantasy football — but the NFL tracking footballs might not be as dramatic as some might hope. The RFID chips in the footballs will track data such as velocity, rotation, ball speed, and location. Traditionally, an 80-yard pass attributed to a quarterback could have resulted from a 10-yard pass followed by 70 yards of running after the catch by the receiver. With chips in footballs, the NFL can more accurately track how many yards the ball was thrown before it was caught. The days of Cincinnati Bengals quarterback Andy Dalton’s stats hiding behind his star wide receiver A.J. Green’s elite speed could be numbered. The NFL began tests in 2015 that focused on putting Zebra’s chips in its footballs. Last season, the NFL extended the in-game testing to include preseason and Thursday Night Football games. 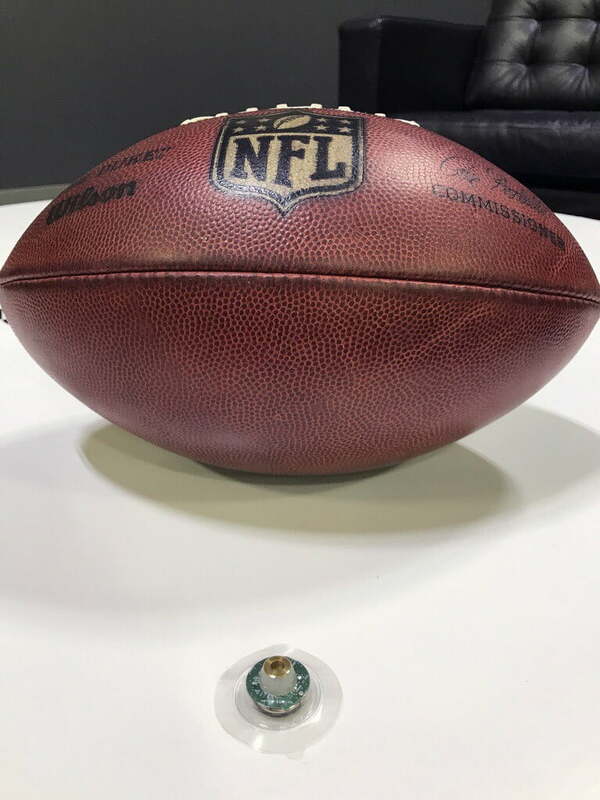 Wilson, the official football provider of the NFL, worked with Zebra to make sure the chip made no changes to the ball that would be noticeable to players or coaches. As a result, Zebra had to reduce the chip’s weight from 12 grams to less than 4 grams. After being placed in other areas, the chip is now “fused to the bladder” of the football opposite the valve opening where air is pumped in, according to a Zebra rep.
As part of Zebra’s system, between 20 and 22 RFID receptors are lined across the ribbon board atop each stadium, ready to transmit the positional information provided by the tracking chips. The technology is smart enough to turn a football field into data points, but once received, a human is still required to have it all make sense when it gets in to the NFL’s hands. “Every game has operators in it that will add contextual information as it happens on the field. That is delivered in real time to the NFL,” John Bacon, Zebra Technologies‘ director of operations, told Digital Trends. For the average game, Zebra tracks more than 670 million bytes of data. For the past three years, Zebra has placed its chips on players’ shoulder pads, on referees, and on first-down measuring sticks to cull information for the league’s Next Gen Stats initiative, which was started in 2013 to deliver more in-depth stats. When Adrian Peterson rushed for an 80-yard touchdown against the Oakland Raiders in 2015, Zebra’s chips in his shoulder pads revealed what his max speed was during the run. While these chips have been used to produce highly detailed and stylized highlight reels, they have mostly helped the NFL in ways the average fan would not think twice about. “It might not be a speed trail, necessarily, or some interesting graphic. It might just be literally to help the broadcasters know who’s on the field now,” Bacon said. Even if you are at a game, you probably wouldn’t know that the football zipping around is actually transmitting stats unless someone told you. “The real-time effects, I don’t often see it up on the big board,” Bacon said. Bacon says the NFL is currently testing its chips on pylons and measuring sticks used to judge the spot of the ball. The chips can only provide location within six inches of accuracy and have not yet been placed on body parts that determine field position, such as a player’s feet and knees. Those six inches could be the difference between a fourth-down play that extends a drive and one that ends the game. The NFL has been going through a not-so-subtle transformation in the last two years. In that time, the league has taken its game to virtual reality, streamed Thursday Night Football games on Twitter and Amazon, and made a commitment to reduce commercial time during games. Maybe with the NFL tracking player’s movements, players can get more accurate Madden ratings. Beyond the NFL, Zebra says its next logical step is working with the NCAA. It began working with Ohio State University in 2016, with plans to expand to more teams. Zebra’s deal with the NFL will run until the end of the 2018 NFL season, including playoff games. Your favorite quarterback could be slinging a tracking chip-embedded football during the next two Super Bowls, and most fans may never realize it.